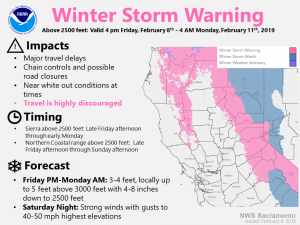 February 8, 2019 – Cold and showery pattern returns with several weather systems forecast to bring low-elevation snow to the region into next week. 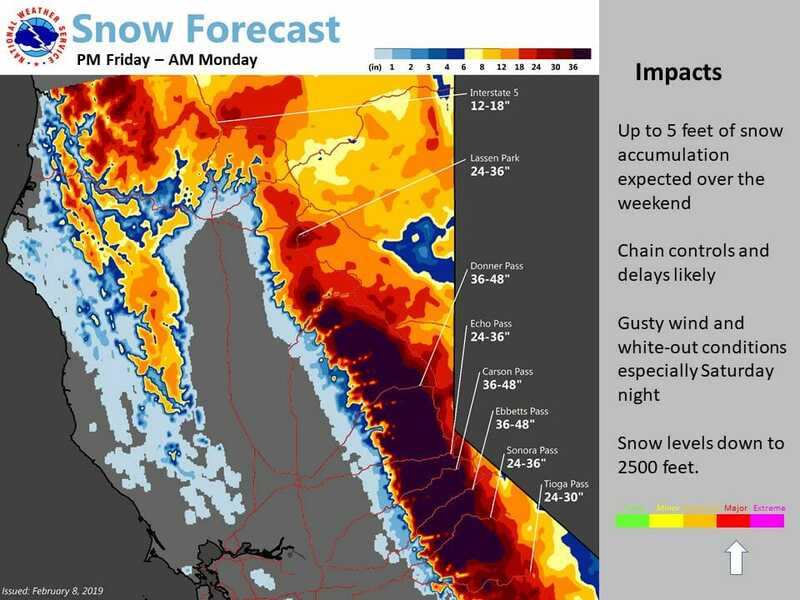 Check ahead before planning travel into the foothills and mountains. Partly to mostly cloudy skies cover the region early this morning as satellite imagery shows the cold upper low (and its bands of associated showers) off the northwest coast of California centered along 130W just to the south of 40N. Current temperatures are milder compared to 24 hours ago due to the cloud cover and range from the single digits in the mountain valleys to the mid 30s to mid 40s across the Central Valley. Several cold systems are forecast to affect the region into early next week. 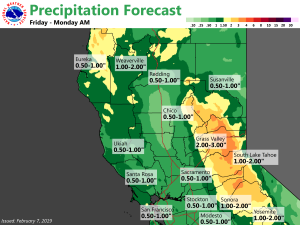 This first disturbance and associated frontal band pivots through central California tonight bringing increased precipitation out ahead of it by late this afternoon or early this evening. Snow levels remain fairly low, so accumulating snowfall likely again for the Coastal Range and foothills. 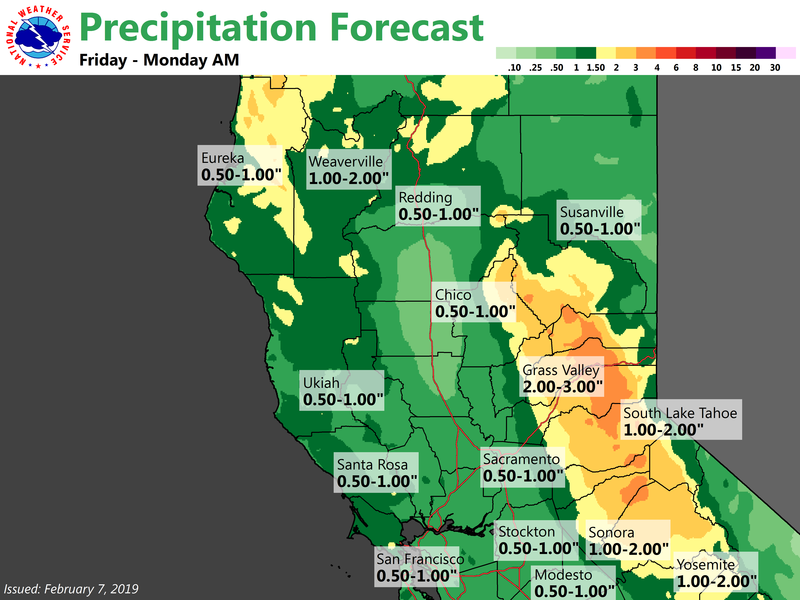 Highest POP/QPF will be across the southern half of the forecast area with lighter amounts over the northern mountains and northern Sacramento Valley. The break between the first system and a second stronger system will be very brief, and likely not noticeable for many areas. A brief break in showers will be possible Saturday morning before the next round of showers drops south with the cold front Saturday afternoon. Another break will be possible later Sunday and Sunday night before a third system spreads precipitation back into the region early next week. 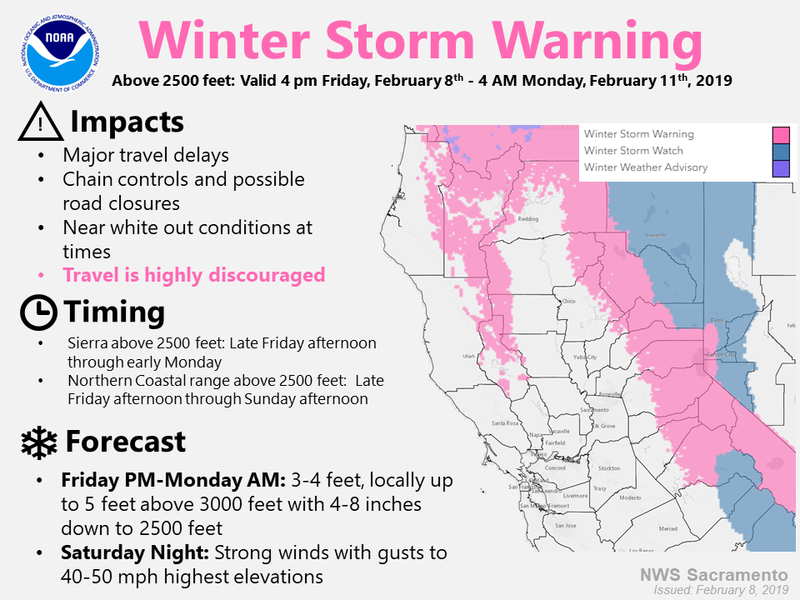 Although winter impacts are likely over the mountains this weekend due to moderate snowfall, the colder and drier source region of these weather systems will limit moisture and Valley rainfall. Therefore flood or debris flow impacts are not expected at the lower elevations. Best chance for a little snow across the northern Sacramento Valley will be Sunday. Active pattern is expected by mid-late next week given persistent troughing pattern. However, storm strength and timing differences are still evident leading to low confidence in specific details. Guidance suggests a strong system diving southward around the middle of next week that could have a chance to tap some Pacific moisture, and bring widespread precipitation across the region. At this point, the GFS is the most aggressive solution. In addition, the GFS and EC disagree with how quickly to eject this system eastward, with the ECMWF being much more progressive than the GFS. Additional waves of precipitation could be possible late in the week, potentially through next weekend.